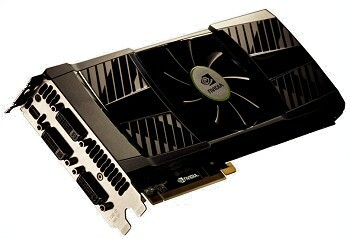 A few latest details of NVIDIA’s upcoming GeForce GTX 690 (Dual GK104) GPU have been revealed by Expreview. The GeForce GTX 690 would be NVIDIA’s next generation dual chip graphics card based on two GK104 28nm Kepler Cores and would launch in May 2012. New details tell that the card would be powered through two 8 Pin Connectors while the rear display panel would include three DVI connector and a mini DisplayPort interface. All of the latest NVIDIA Technologies would be supported by the GPU such as PCI-E 3.0 compatibility, adaptive vertical sync,GPU Boost, TXAA anti-aliasing, 3D Vision Surround. A Minimum Power Supply requirement of 650W would be recommended with the GeForce GTX 690. Additional Specifications and details can be found here.